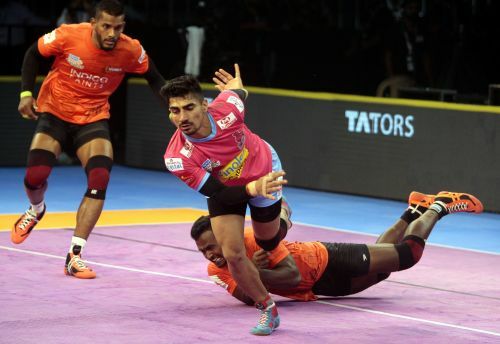 In a meeting of familiar foes, U Mumba emerged victorious as they beat the Jaipur Pink Panthers 39-32 to register their first win of the season. Mumba had earlier tied 32-32 with Puneri Paltan on Sunday. Siddharth Desai, who had a fantastic debut in the first game, was once again outstanding for U Mumba as he tallied 13 points from 17 raids. The Pink Panthers inflicted the first All Out of the game, but behind an excellent defensive showing and Siddharth's raiding, U Mumba came back to finish strongly and take the game in the last 5 minutes. Mumba started with three Iranians; alongside Atrachali, Abolfazl Maghsoudlou and Hadi Tajik also started the game. But the latter duo were withdrawn midway after failing to make an impact for Rohit Baliyan and Rajaguru Subramanian. The changes worked and Atrachali mentioned that his team is always ready with backup plans. “We have a lot of plans. If first plan doesn't work, then second plan. Our coach felt it was not working out so we decided to change”, said Atrachali. “Also Abolfazl is little tired, not fully ready”, said the U Mumba skipper referring to his countryman's late arrival. He also mentioned he's enjoying the role of captaining the U Mumba side. “I'm very happy to be captain. My favourite team in Pro Kabaddi. I hope the fans are liking the team's performance”, said Atrachali. For Jaipur, their coach Srinivas Reddy felt they let the game slip after a good start. New captain Anup Kumar, formerly of U Mumba, felt they could have done better in the raiding department. “I think we could have done better in the raiding department. The raiders disappointed today. We didn't give a good performance, myself and Deepak (Hooda). We need to up our game in the next match”, said Anup. The Pink Panthers and U Mumba both play Haryana Steelers next, with Mumba playing them on Saturday while for the Panthers it's on Tuesday.